Being well-rounded can give you an edge when competing for at spot at universities around the country. As you prepare to apply for college, good grades and high test scores are important, but there are other ways to show admissions officers that you're the right fit. In a world where there are scores of high school seniors applying to schools, many of which are becoming increasingly demanding, it's important to give yourself an edge. When you consider that some students might have good GPA, it becomes even more vital to show that you are more than just a number. Financial aid is more available and more abundant than a lot of families realize. Many of the countryâ€™s most elite and most expensive colleges are extremely generous with need-based financial aid, and there is scholarship money, both merit and need-based, waiting for students and families willing to seek it out and apply for it. Students might be surprised at what they can afford.At both state and private universities, legacy status which can mean different things depending on the institution, including students whose grandparents, parents, and/or siblings attended the school for either undergrad or graduate school or other alumni connections in no way guarantee admission, and students and their parents should set their expectations according to how qualified the student is for the school on their own, not how many family members attended there or how much money they give to the school each year. Schools have too many students with connections to the university to accept them all. With early decision, colleges understand they are requiring a commitment and thus recognize early devotion to their school. Applicants should understand that the pool of applicants is smaller if and when they are able to apply early decision. Many college students are afraid to commit to one school and/or are afraid, or unprepared, to commit too early. If an applicant is sure of and committed to a university, taking the plunge and applying early decision can boost the odds of admission simply with the pool of students being lower. Colleges and universities care a great deal about their yield because it has an impact on their prestige, planning, and finances; students who apply early decision have committed to the institution and that helps institutions boost their yields. Your letters of recommendation can give your college application an edge as well. Build relationships with the advisers and organization leaders that head up programs you're involved with. These relationships will help them provide a comprehensive view of your strengths and abilities in their letters. Students should do the same with their teachers, so admissions officers can get an idea of how you behave inside and outside of class. Your letters of recommendation should focus on how you accomplish your schoolwork, excel in your extracurricular activities, and describe how you interact with other students etc. 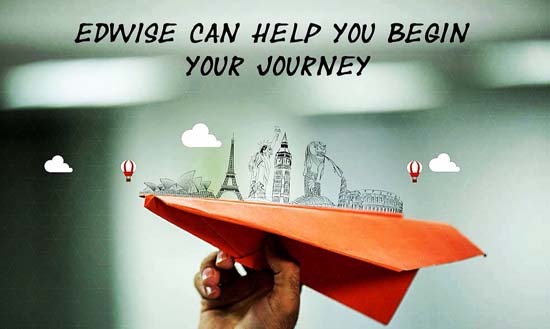 For complete information of Overseas College Admission ConsultantsContact Edwise International - Study Abroad Consultants, on 1-800-200-3678 (Toll Free) / 08600911333.